Seriously! I love this grouchy herb so much for the way it adamantly protects it’s valuable nature. Perhaps it is my soul plant. 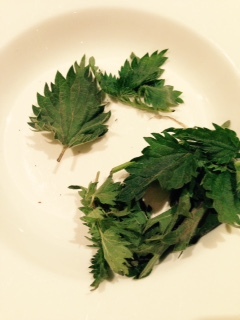 Nettle arrives in the spring, heavy with nutrients and green cleansing goodness after a long winter. We need her medicine. I picked up some fresh nettle at the farmer’s market this past weekend, from the beautiful women of Whole Circle Farm, added it to the fresh mushrooms in my basket, picked up my pastured egg share from Sylvia of Stoddart Family Farm and headed home to make a springtime fritatta! In a cast iron (or oven safe) pan, cook nettles first in a bit of coconut oil and water over medium-low for 10 mins to cook the “sting” out. Remove from pan and set aside. Increase the temp to medium-high, add a bit more coconut oil and cook the onions until translucent. Add mushrooms, garlic, herbs and salt and sautee until mushrooms are cooked. Add nettle back to the pan and sautee 1 minute more. Distribute the veggies evenly over the bottom of the pan. Transfer the pan to the oven and bake 15-20 minutes or until the eggs are completely set in the middle. Serve with fermented hot sauce (from Alchemy Pickle Co!) and a dandelion green and sprout salad! *note on garlic – crush your garlic and allow it to sit at least 5 minutes before cooking it. Crushing it allows the components of garlic to blend and maximize the health benefits of this amazing bulb!